ST. LOUIS - For the seventh consecutive year, Webster University was recognized by Military Times for its superior graduation rates, accommodations, incentives and services offered to military veterans. Military Times is a publisher of several national military-themed magazines. The University appears on the magazines annual “Best for Vets: Colleges 2019” list, published online this week and in the upcoming November issues of several of its publications. Overall, Webster was ranked 17th among all private institutions in the United States, and 84th among all institutions on the annual list. 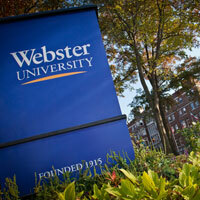 Webster is one of only two universities in Missouri ranked this year. More than 500 institutions were reviewed, but only 137 institutions were selected for the list. According to Military Times’ analysis, Webster has one of the highest six-year graduation rates for veterans in the country. Overall, Webster was ranked 27th among all four-year institutions in the United States for graduation rates among vets, and 10th among all private institutions. Approximately one-fifth of all Webster students have served or are currently serving in the military. Webster has locations on 29 military bases in the United States. Veterans, active-duty service members and their family members also receive educational services at Webster’s metro and international locations located in 27 U.S. cities and seven other countries, as well as through the Online Learning Center. The University offers a robust package of financial aid and tuition discounts to veterans, including the USA Scholarship Program, the Proud to Serve Scholarship for Military Dependents, the NFMA Military Spouse Program, the Fallen Patriot Scholarship, the Folds of Honor Scholarship Program, and the First Responders Scholarship. A full array of other scholarships and financial aid packages also are available to Webster’s military and veteran students through the Department of Defense and other related organizations. Webster offers the TA Top-Up Program that supplements GI Bill benefits and a stipend for ROTC officers. Webster University also proudly participates in the VA's Yellow Ribbon GI Education Program, designed to help military students avoid out-of-pocket tuition and fees that may exceed the Post 9/11 GI Bill tuition benefit. Webster has a long history of providing educations opportunities to members of the military. The University formed its first student veterans’ association shortly after World War II ended, due to the high number of female students who volunteered during the war and returned to the University in the years following the end of the war to finish their degrees. In 1968, Webster established the Veterans Accelerated Urban Learning for Teaching (VAULT) to train Vietnam War veterans to teach or assume other professional roles in inner-city schools. In 1974, the U.S. Department of Defense invited Webster College to become the first to open an extended campus program at Fort Sheridan near Chicago. Military locations also opened at Scott AFB, Illinois and Fort Leonard Wood, Missouri. The program provided military personnel with access to quality higher education on base. Today, Webster has a presence on dozens of military installations across the U.S. The Military Times’ “Best for Vets” list is an editorially independent news project that evaluates the many factors that help make colleges and universities a good fit for service members, military veterans and their families. The rankings are published in full in the issues of Army Times, Navy Times, Air Force Times and Marine Corps Times on newsstands in early November; and online at MilitaryTimes.com, as well as ArmyTimes.com, NavyTimes.com, AirForceTimes.com and MarineCorpsTimes.com. The full rankings can be found online at https://rebootcamp.militarytimes.com/news/education/2018/10/22/best-for-vets-colleges-the-best-schools-for-military-students-in-2019/. For more information on Webster University’s military programs, visit http://www.webster.edu/military/.